Evinrude is no longer producing the 4 cylinder two stroke 115 HO and 130. This motor was a favorite of the owners of Dyna-Ski Boats on horsepower restricted Lake Dyna-Ski as I call it. There is a story about the lake on this blog. The 135 HO is a 2.6L V-6 two stroke E-Tec tuned to 148 HP. It runs on the same block as the 150, but has been re-mapped down to the 135 HO. The motor comes in Blue or White in the 20", and White only for the 25". The 20" model will have the high-speed lighting gearcase [same as the 150 HO] and the 25" will have the SLE case, available in standard and counter rotation. 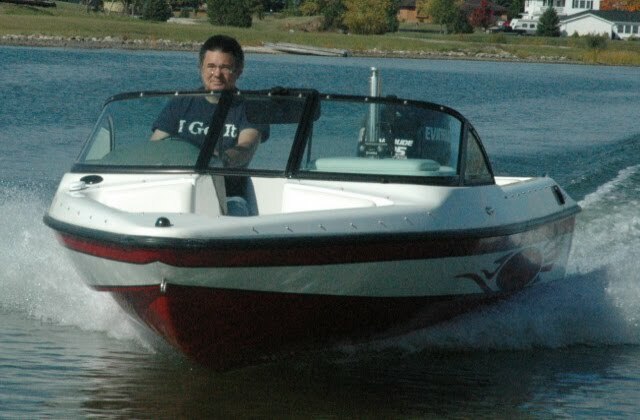 Dyna-Ski Boats are made with a 20" transom. Being a V-6 means the motor can be used with Evinrude Digital Control system I-Con. I-Con is an awesome control and engine monitoring system. It is super smooth and allows throttle increases and decreases of 50 RPMs easily. Try this with a cable controlled throttle system. It is not an inexpensive system though. The retail cost of this new motor will be around $850 less than a 150. Water ski boats like outboard motors that have more cubic inches and torque. The more torque the better. Horsepower gives boats their top end speed. With a 17.6 Open Bow Dyna-Ski running into the low 50's (GPS Speedometer) with a water ski prop I'm guessing that the 135 HO will be a little slower but still faster than any inboard currently being made. I'd expect a slight improvement in fuel economy but the 150 is pretty stingy on fuel and oil already so the improvement may be hard to determine. After trading emails today with some folks at Evinrude they tell me the low end torque is the same for the 135 HO and 150. Top end should be 2 - 3 mph slower. Fuel economy slightly better. I'm going to get a 135 HO to run on a 17.6 Dyna-Ski or two this summer. After I get some time using the motor I'll give you an update from seat of the pants testing. The video on You Tube is interesting.